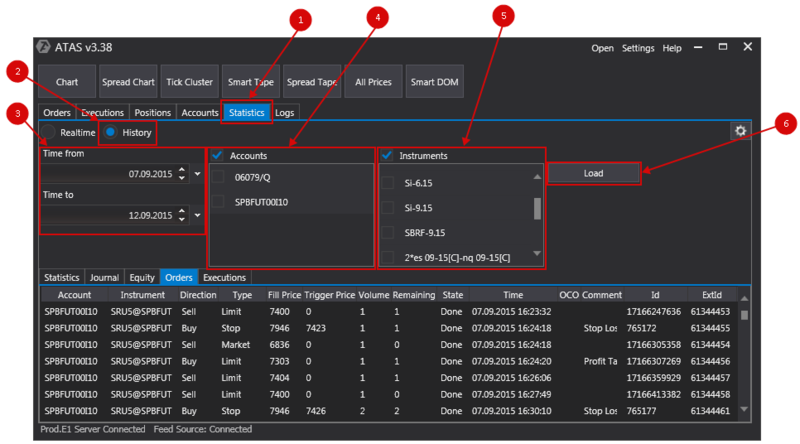 RealTime - this option displays information on trade statistics for the current week and is updated in real time. History - this mode allows downloading data for previous periods. 1. In the Main Window, go to the Statistics tab. 2. Select History. There, you will be able to set parameters for the history. 3. Select the desired time interval. 4. Set checkbox next to the required accounts. If you want to select all the accounts, set Accounts checkbox. 5. Set checkbox next to the required instruments. If you want to select all the instruments, set Instruments checkbox. After that, the statistics module will load all the data on transactions according to the specified parameters. This tab provides detailed trade statistics. Total trades — the number of trades for the selected period. Total PnL — the final result of the trades. Average PnL —the average profit/loss y of a trade. Max drawdown— the largest drawdown related to the initial balance of the account. Max relative drawdown — the largest drawdown related to the peak value of the trading account balance. Recovery factor —the characteristic of a trading system or results of a trader, which is calculated as the ratio of the absolute profit to the maximal drawdown. Profit factor — the ratio of total profit from all the profitable trades vs the total loss from all the unprofitable ones. Profitable trades — the number of profitable trades. Profitable PnL — the final result of profitable trades. Average profit — the average result of a profitable trade. Losing trades — the number of unprofitable trades. Losing PnL — the final result on unprofitable trades. Average loss — the average result of losing trades. Total days — the number of trading days during the selected period. Profit days — the number of profitable day for the selected period. Loss days — the number of loss days for the selected period. Commission — the total commission for all the trades for the selected period. *Please note, that if you have not set up commission data in the ATAS platform, the data will be reflected as zeros! Commission settings can be reviewed in the section: Commission rates. Journal. This tab contains information on transactions. Account — trading account number. Instrument — the abbreviated name of the instrument. Open Time — the date and the time of opening of the trade. Open price — the price at which the trade is opened. Open volume — the open volume of contracts/lots. Close time — the date and the time of closing of the trade. Close price — the price at which the trade was closed. Close volume — the closed volume of contracts/lots. Price PnL — the difference between opening and closing prices. Profit (Ticks) — the difference between opening and closing prices divided by the tick. PnL — the plus/minus on closed positions in monetary equivalent. This tab indicates the yield curve adjusted for all the transactions that are included in the sample. Orders — this tab displays all orders for the selected period. Account — the trading account number. Direction — the direction of the order (buys/sells). Type — the order type (limit/market/stop). Fill Price — the price of filling the order. Trigger Price — the order trigger price. Volume — size of (contracts/lots) the order. Remaining — the non-filled part of the order. State — the order status (filled/active). Time — order issuance date and time. OCO group (One Cancel the Other) When one of the orders included in the OCO group is filled, the other orders are automatically canceled. Id — order ID allocated by the exchange. At this tab contains information on the filled orders for the selected period. Volume — the filled volume. Price — order filling price. Time — order filling date and time. Order ID allocated by the exchange. * The Statistics tab also features a button to adjust statistics. 1. 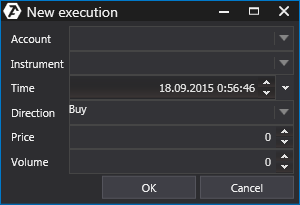 New execution.This options is used to manually create a transaction that will lead to the alignment of positions. In this window we can see the transactions that can be created on the basis of existing positions. Clicking on each trade will activate the field to the right, which contains modifiable parameters of trades such as trade price or amount. After making all the adjustments, it is necessary to press OK button to register the new transactions in the statistics for the alignment of positions. 3. Export statistics — this option allows exporting statistics to an Excel file. 4. Clear database — this option is needed to delete all the ATAS statistics.